Couldn't he be an 8 Mana 7/9? He'd be cost/stat neutral so only one enemy minion death and he'd be providing value. Plus, a 9 health minion would be fairly sticky, helping him trigger his effect more. I've been using a weird odd dragon paladin deck where this guy occasionally pulls through. 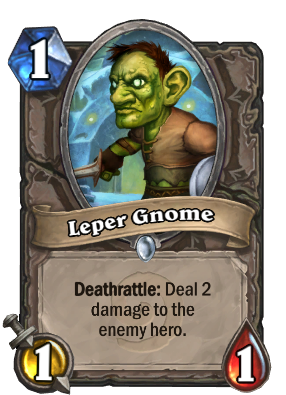 He feels decent if you can trade a lot of minions with your opponent on the turn you play him, but he's really situational and got hit pretty hard by the ancient Leper Gnome nerf. I wouldn't recommend crafting him unless some awesome Wild synergy comes around, but I can't bring myself to disenchant him either. Aren't those cards affected by every legendary? Well, since Backstreet Leper has been created and we are stuck with it. 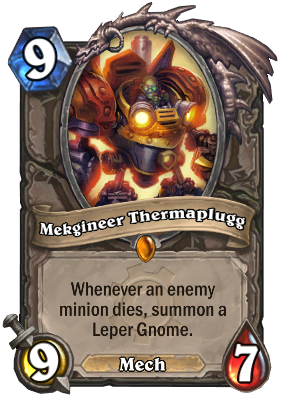 Why not fix the wild card Mekgineer Thermaplugg which was a bad card that got nerfed indirectly by the Leper Gnome nerf? Perhaps the card would say something like summon a random leper? It's ironic that a useless card is going to be even more useless. He doesn't see play and won't see play when rotated to wild. Saw him being used in a Mech Mage deck yesterday, does anyone else tried him in any decks? This would be alright in a double deathrattle brawl, since the leper gnomes can deal 4 each, and Shredders, Spiders and Harvest Golems provide a massive number of weak minions you can murder for more gnomes. It creates value, what's not to love?